August was the month for reading books that have become movies. I admit it was the movie trailer of City of Bones that first got me interested in reading the books. And I just had to read the book before seeing the movie. Cassandra Clare takes familiar mythology and mixes in a good dose of her own in this first book in the Mortal Instruments series. I was quite taken with the world she has created: a world of Shadowhunters, Downworlders, demons and just about everything else imaginable. As you often find with young adult paranormal romances, you have the innocent girl who suddenly finds herself thrust into an unknown world, one in which she has untapped powers and the ability to bring cute boys to their knees. You have that here, more or less. In big doses such tropes draw a big yawn, but occasionally, they prove to be a fun guilty pleasure. At least for this reader. I was often reminded of Harry Potter, to be honest. There were similarities that I found hard to ignore. As I told my husband in a discussion on the subject after finishing the book and seeing the movie, however, I came to recognize that these are common themes we see throughout literature. The idea of wanting a "pure" society, being among them. I confess to getting a little tired of the love triangles--of which there were three or four (I lost count after awhile), but I did enjoy the other aspects of the novel overall. I wanted to be a Shadowhunter myself as I read. I was fascinated by the actual City of Bones, for which this particular book in the series is named. I wouldn't mind spending more time there, exploring and learning its secrets. Unfortunately, it plays such a small part in the book. There were many aspects of the book I thoroughly enjoyed from the Institute where Jace and the other Shadowhunters are living to the scene leading up to Clary and Jace's entrance into the vampire lair. I was particularly fascinated by the warlock Magnus Bane. Throughout the novel there was plenty of action and tease-like-romance as well as a small dose of humor (Simon and the mouse incident, the flying motorcycles, i.e.). Or maybe that was just me. I hope it was intended. Anyway, I enjoyed reading this novel and am curious as to where the next one in the series will take me. In my eagerness to read a book before the movie version comes out, I often find myself finishing the book weeks, sometimes days, before seeing the actual movie. This is both a bad and good thing. On the downside, all of the details from the book are still fresh in my mind, making it impossible for the movie to ever live up to my expectations. I notice just about every hole imaginable. On the upside, however, knowing and remembering all those details adds a depth and richness to my movie watching experience. Having background information on the characters can be a real plus. If a movie is very well done, I can usually overlook discrepancies and even come to view the movie and book as the separate entities they are, enjoying them both equally--or almost equally. When I am less than impressed, those discrepancies stand out. 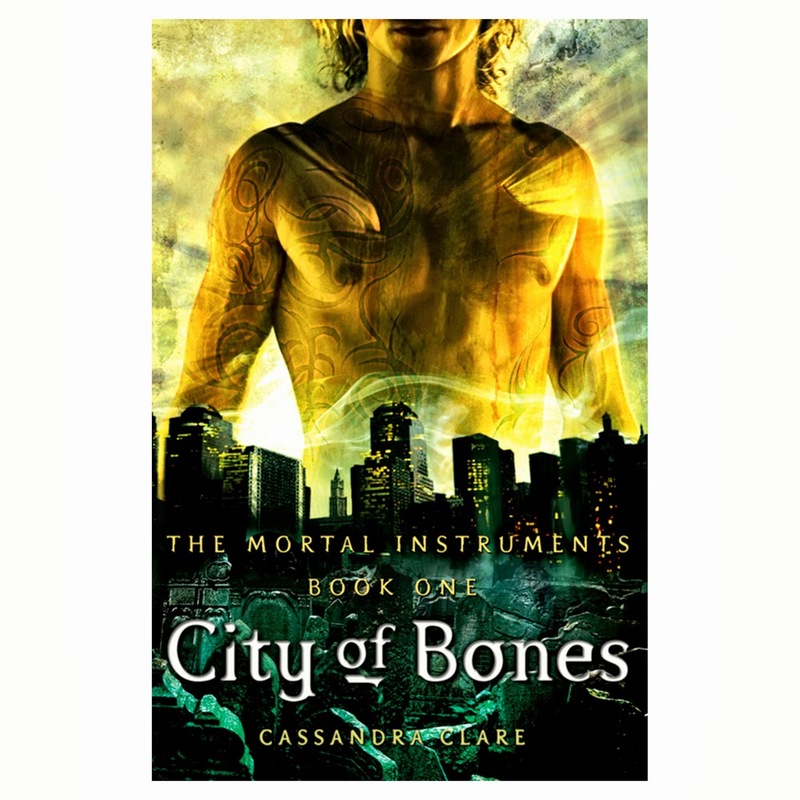 Unfortunately for City of Bones, the discrepancies stood out. I liked certain aspects of the movie (Magnus Bane was nothing like I pictured him, but he was totally amazing in the movie and I think I like the movie version best) and the special effects, but I was less than thrilled at several changes that were made or scenes that were left out for the sake of time or what have you. Some of the relationship dynamics between the characters were sorely lacking in the movie. There was also a major spoiler in the movie that I understand does not come out until one of the later books in the series. While it's something I suspected while reading the book, it bothered me that it was so quickly given away in the movie. Not to mention the way it was blurted out. I don't think the movie was a total failure. As I said, I did like parts of it. I just wish it had been more true to the book. You can learn more about Cassandra Clare and her book on the author's website. Source: I bought an e-copy of this book for my own reading pleasure. I also saw the movie on my own dime. I had this book and lent it to my niece, who then moved away without returning it! So I have to get another copy soon - it did look good, and so did the movie. I really enjoyed your review, Wendy. I have a feeling I will like the same parts you did, and want to be a shadow-hunter also. Susan - Oh no! I hope you are able to get a hold of another copy so you can read it. Jill compared this one to Harry Potter in her reviews as well. I feel like the series is SO POPULAR with a lot of bloggers, so it must hit its target audience very well. But from what i've seen in your and Jill's reviews, I don't think I'd enjoy it. I really dislike love triangles and girls who are apparently really shy and awkward somehow then getting all the guys and only gaining confidence that way. Aarti - I am glad I am not the only one who saw the similarities. :-) I am not sure I'd say the main character's confidence came from getting all the guys--it really came from her coming into her own and knowing her powers--but I know what you mean, and agree.